Air ride suspension gives your car a boost that makes it glide, not just drive. It’s nearly impossible to get the same results with any other suspension kit. Today’s air ride suspension parts have evolved significantly. Now, you can find air ride suspension kits for the most popular makes and models on the road to give you the ultimate convenience, as well as a smoother-than-factory ride. At CCE, we find the best suspension kits to match your vehicle and match your style. An air suspension offers at least two major benefits and we match you with the brand and model you need the most. Whether you prefer soft and comfortable, or firm and tight, you can customize the feel anytime, anywhere. Stance: Air suspensions make it easy to lower the car without sacrificing drivability. Whether you want a spark-throwing mini-truck or simply want a lower ride for a better look, air suspensions make it easy to achieve the aesthetic you desire, while allowing you to still raise your car back up for normal cruising, gas stations, etc. Load Carrying: The original use for air ride kits was helping 18-wheelers carry heavy loads. Today, it can make your SUV or pick-up more drivable even with the biggest loads. If you know what you want, but you’re not exactly sure how to get it, CCE can help. Our experts know and understand the market like none other. From double-convoluted, tapered-sleeve, and rolling-sleeves, we know what will work best for you in all of the top market brands including Viair, Airlift, Accuair, Ride Tech, Slam Specialties and Firestone. 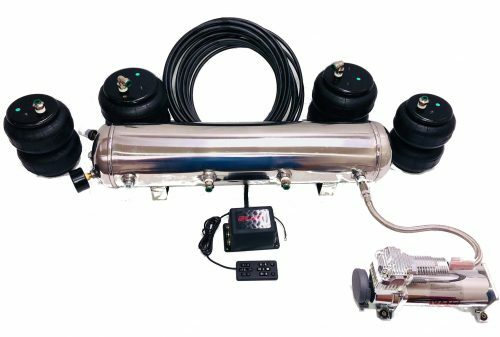 Our air ride kits offer the convenience of all-for-one price and you have everything you need for your air ride vision. If you’re ready to get started, give us a call today.